calm by dosist™ is a high CBD formula in a 10:1 ratio of CBD to THC. A calming terpene blend of myrcene, limonene, and B-caryophyllene promotes inner peacefulness when properly dosed. CBD may also provide relief from the feelings/symptoms of anxiety. 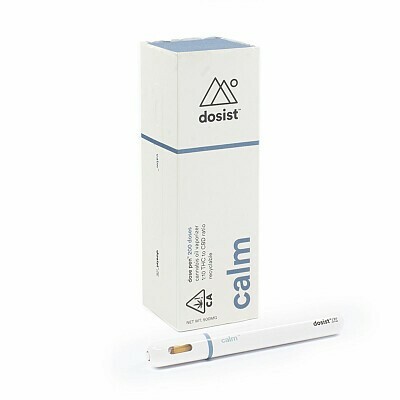 Over 50 doses of calm by dosist™ come in a preloaded dose pen by dosist™, a recyclable vaporizing device designed exclusively for dosist's formulas and featuring precise dosage delivery (2.25 mg per dose), airflow control, and superior heating technology. dosist ’s formulas are 88% cannabinoids and 12% terpenes —THEY CONTAIN NO ADDITIVES OR FILLERS.